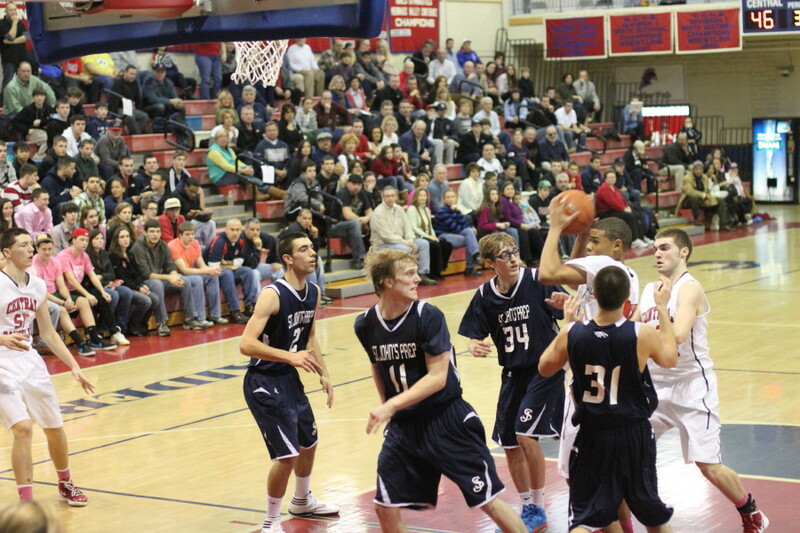 Steve Haladyna (10 points) closely guarded by Joel Berroa (#25 – 20 points) and Tyler Nelson (#11 – 11 points). 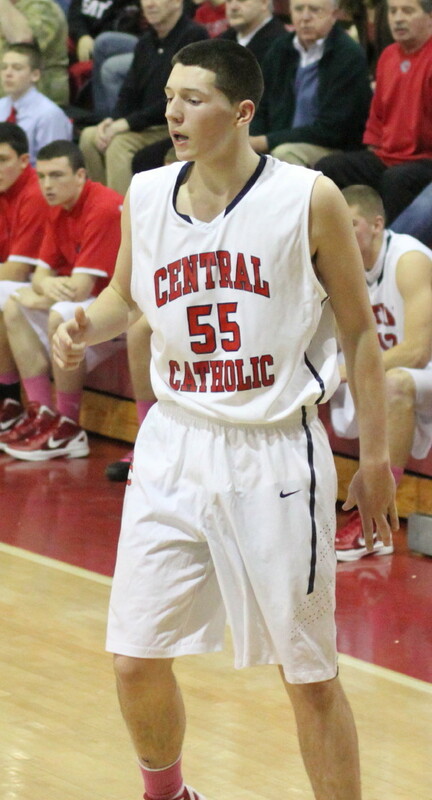 (Lawrence) Central Catholic is good……..very good. 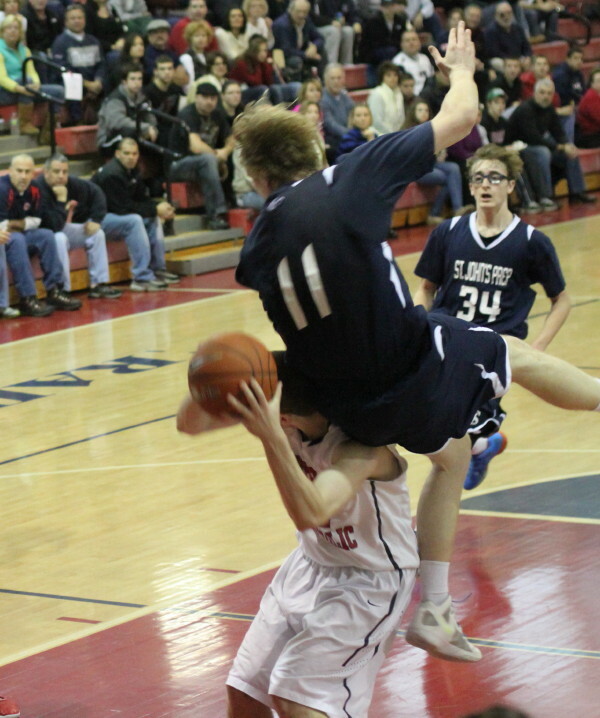 The Raiders (12-0) overwhelmed St. John’s Prep, 80-56, Sunday afternoon before a crowd that dwindled as the start of the Patriots/Ravens game neared. It was hard tell which CC was better at, scoring or pressure defending, because they were impressive at both. The Raiders were able to run an organized offense against a tight Eagle defense and found openings for nineteen layups. They also hit from long range connecting on six triples. 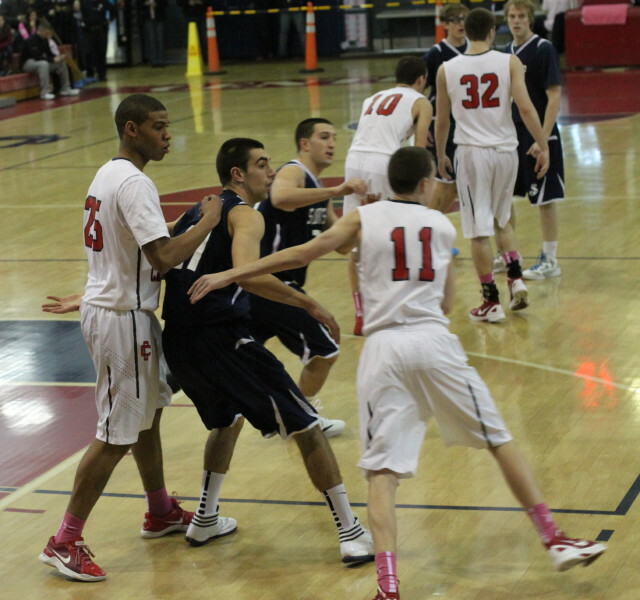 Defensively, the combo of Joel Berroa and Lucas Hammel, kept the ball away from high-scoring Steve Haladyna. 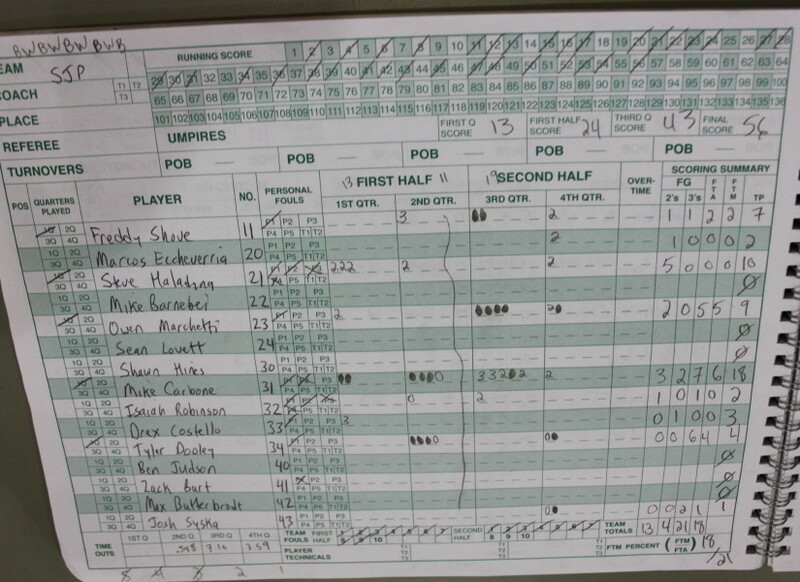 (I saw Steve drop twenty-six on BC High on Friday night.) 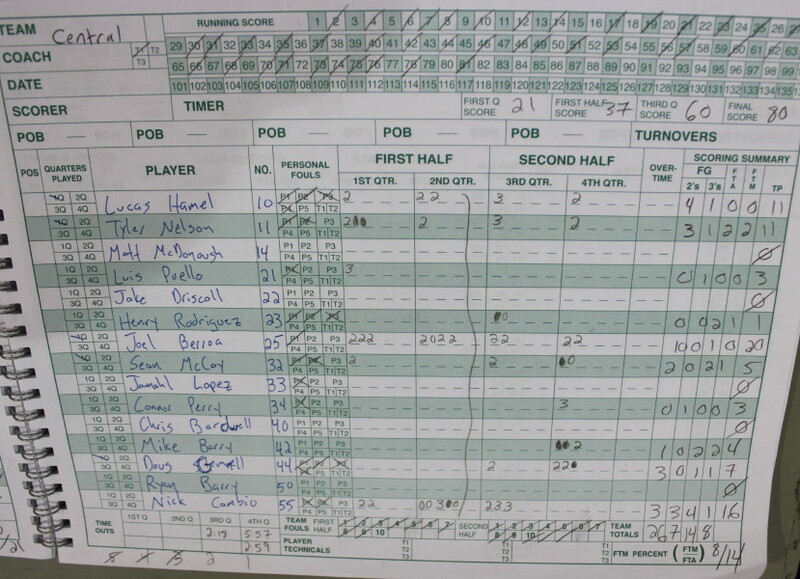 In this one, his total was ten points with only two coming in the second half. The Raiders inside players 6-4 Joel Berroa (20 points) and 6-5 Nick Cambio (16 points) produced the big numbers for the home team. Nick hit three triples. 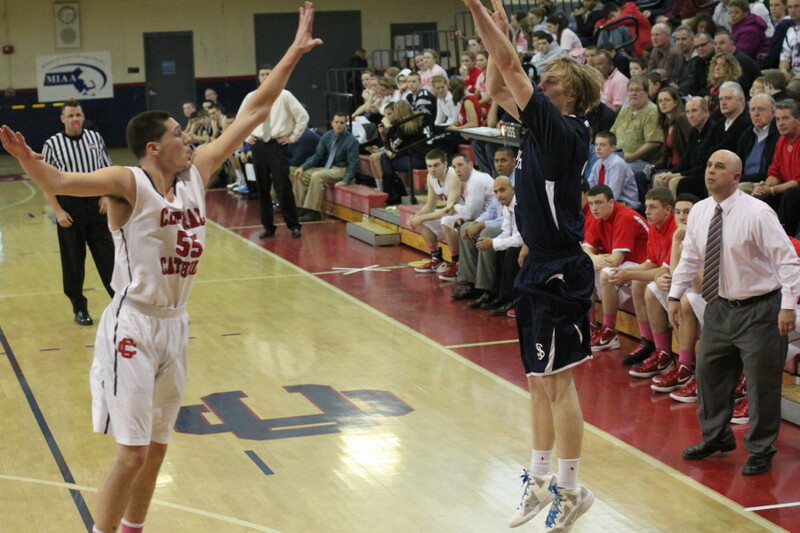 Mike Carbone (18 points) carried the Eagles (9-3) in the second half with thirteen points. 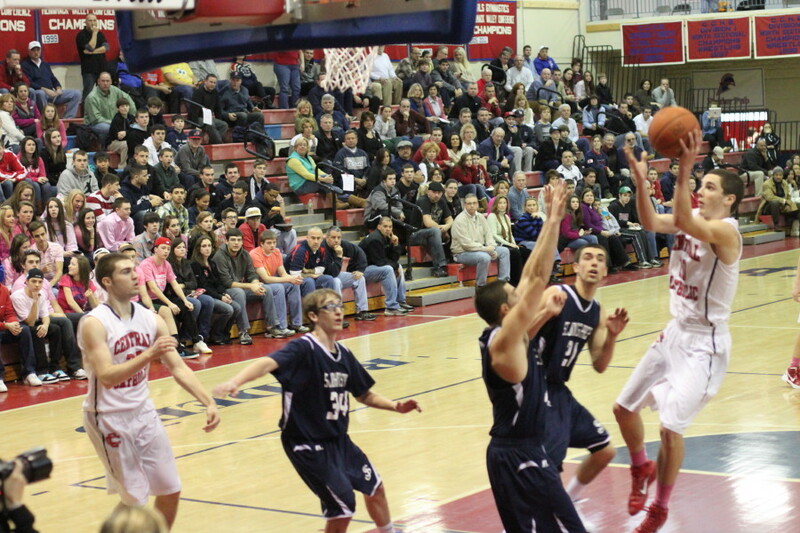 St. John’s made a game of it for about six minutes trailing just 14-13 as Steve Haladyna got inside for three straight hoops. Thereafter the denial defense on Steve kicked in and the Raider runs began. A three by Luis Puello, and a couple of Lucas Hammel layups and the Raider lead jumped to ten (23-13) early in the second period. 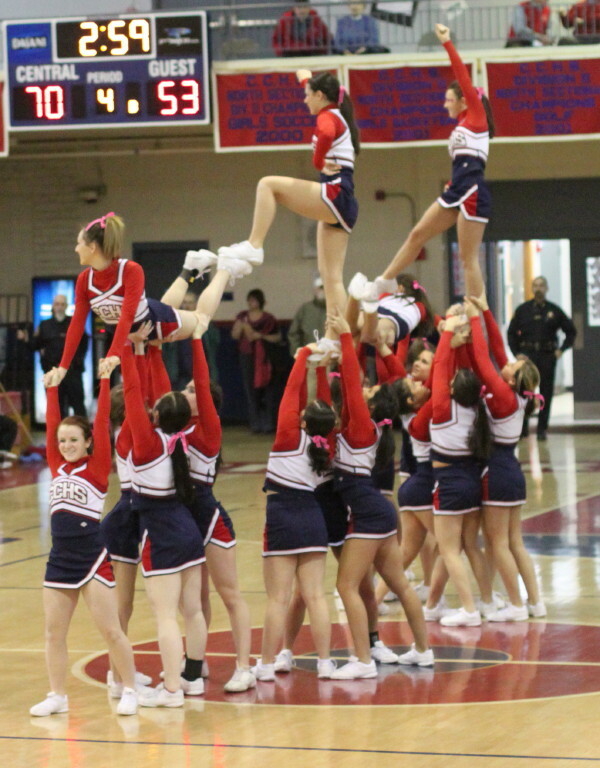 The Eagles were able to hang around and trailed only 27-22 with 2:50 remaining in the first half. Over the next 3:40 of playing time this game got away from the Eagles. They searched for offense and gave up four layups and two long ones. 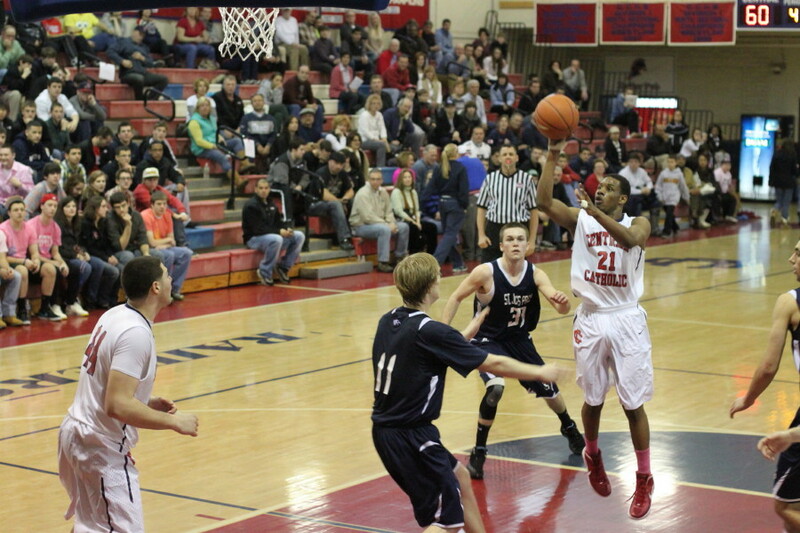 That nasty combo turned into a 15-2 Raider surge and CC led, 42-24, early in the second half. 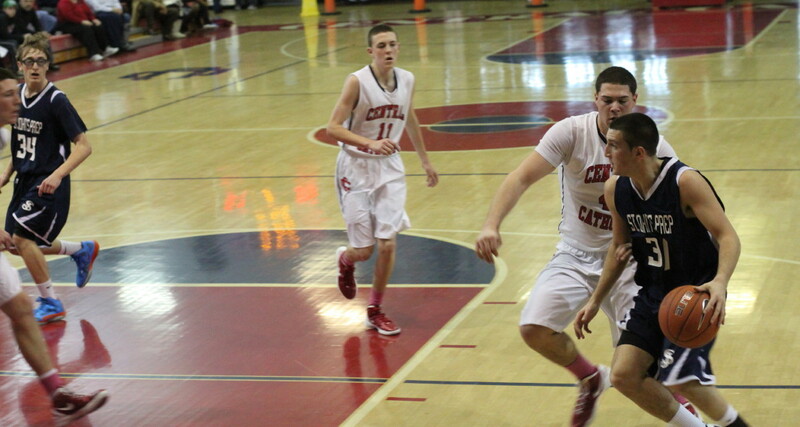 Central Catholic cruised along with a comfortable lead until early in the 4th quarter when their 62-45 advantage shrunk to 62-52 with six minutes left, after seven straight by the Eagles. A timeout by CC coach Rick Nault seemed to straighten things out as all five starters scored in the next four minutes. The Raiders put a 12-1 hit on the Eagles and were in complete control 74-53. The reserves from both sides filled out the final two minutes. 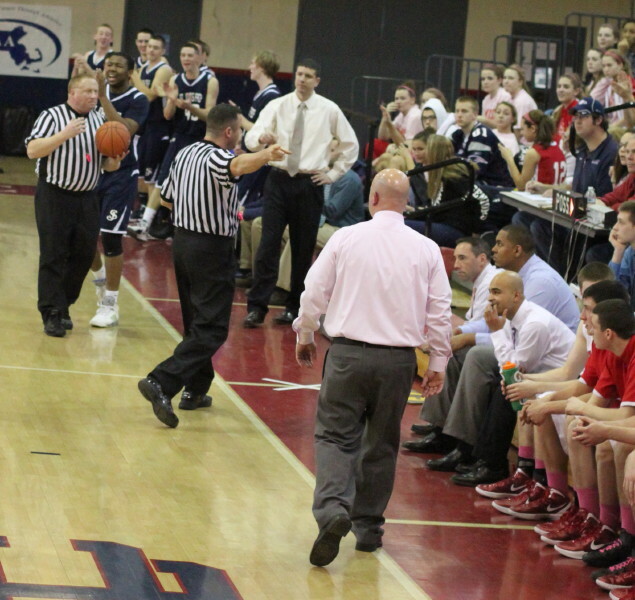 Raider coach Rick Nault picked up a technical foul in the second period. 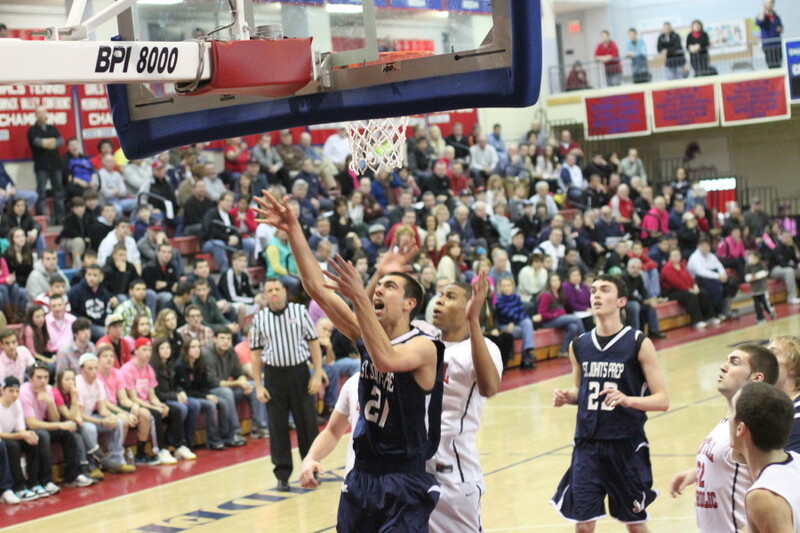 Nick Cambio had a crowd-pleasing jam in the third quarter. After seeing CC for the first time, it is not too difficult to imagine them playing at the Worcester Centrum in mid-March. But on the other hand, the Raiders only beat Lawrence by two points and have a return engagement at Lawrence coming up. Let’s see how that goes first before making too many March assumptions.